Interview: Markus Johnsen (Aerial) – Ouch That Hertz! A few weeks back, we wrote these exact words in regards to an up-and-coming metalcore band that wandered onto our radar: Aerial. To this day, we still mean exactly what we said. What we never did- and never could have- anticipated was exactly how influential and novel this Nordic outfit would be. 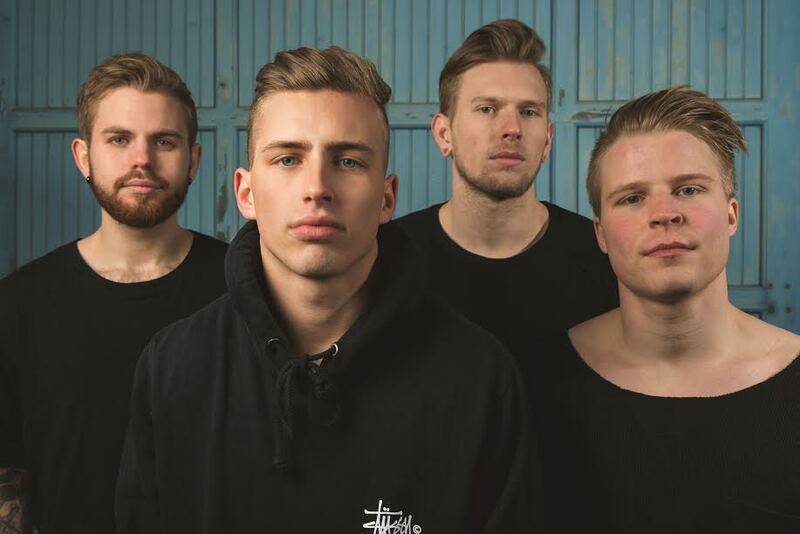 We never thought we’d be so irrevocably hooked on their specific sound, but we can say with certain definitiveness that Aerial posseses a refreshing approach and quality in metalcore that our ears simply cannot get enough of. One thorough listening of their EP Foresight is an ample demonstration of Aerial’s deft musicality and dynamicism, which denote an embittered turn of the tides in the genre of metalcore overall. Destructively heavy and gorgeously melodic, Aerial’s deluge quenches the thirst of any metalcore fan that has felt recently starved by a series of lackluster copycats. We had the immense pleasure of speaking with Aerial’s frontman, Markus Johnsen, about a variety of topics: from his stellar vocal covers on his YouTube channel to the trials and tribulations that brought Aerial to where they are today; from their recent raging success to their new directionality as the band looks toward the future, giving us a taste of what’s yet to come on the band’s imminent horizon. Ouch That Hertz! : Hi, Markus! It’s good to have you on the site with us! Markus: Thanks, stoked to talk to you! OTH! : First off, I have to give you mad props on your vocal skill and talent. I’ve been keeping an eye on your YouTube channel for about a year now. Every single one of your vocal covers are impeccable. You definitely have one of the most interesting voices in the game! Markus: Wow that’s such a great complement man, thanks! Really cool that you’ve checked out my previous work as well! I actually started uploading vocal covers to YouTube for about 5 years ago, but I made most of these videos private a while back. Doing vocals like this definitely requires a lot of time and practice, so getting feedback like this means a lot to me, dude! OTH! : So, let’s dive right into Aerial. We really dig your EP Foresight, back in 2016, and we were thrilled to see your recently released music video for “Foreign Coasts.” Any chance that there will be other music videos from Foresight, or are you more focused on making more teasers for newer material? Markus: We’ve actually focused mostly on our live performance lately, trying to push our performance to new heights. We’ve also focused a lot on behind the scenes work, including new material as well, so as to whether we’ll release another music video or not, I’m actually not sure. OTH! : I’d love to circle back on Foresight for just a second. What I really loved about the whole EP is the consistency in the overall delivery- the gritty, grinding, grim vehemence in every song is perfectly laid out. Also, the technicality in your collective musicianship is just stunning. It’s like a perfect balance between older Northlane material, ERRA, and Invent, Animate. Moving forward, what can we expect out of your newer music? Will we see the same sort of malevolence, or are you pushing for a different direction? Markus: It´s definitely going to be in the same style, but we´ll be make some adjustments. Now that we we’ve found our element, we’ll be experimenting and trying to expand in our sound. If you like Foresight there’s no chance you’re not gonna like what’s coming! OTH! : Furthermore, do you intend to continue to work with Brian Hood, Jesse Cash, and Keaton Goldwire in production? Markus: We’re currently working with Keaton on new material, so we’re kinda stoked on that. We’d love to work with Jesse, but he’s unfortunately not available at the moment. We haven’t started thinking about mixing and recording, so it’s hard to tell what we’ll do with that! OTH! : While we’re still on the subject of newer material, can you give me any details on the upcoming album that you’re currently working on? Are you planning on releasing it later this year? Any fun/interesting details on the process for this release? And do you have a working title for it? Markus: We’re just in the beginning phase with new material, so I don’t have a lot to add to it. Being an independent band makes recording an album extremely expensive, so it’s hard to tell if we’re able to record a full album without being signed to a label. Nevertheless, we’re working very hard to shop for labels to make this process faster, so expect huge things from us. OTH! : Speaking of new things, I see that you added Sebastian Madsen as your new guitarist! What prompted this change? No bad blood between you and your former guitarist, I hope! Markus: Absolutely not! Our old guitarist is the brother of Josef (our bassist), so there’s no bad blood there. After we got back from the UK he decided to leave for university, while the rest of us continued with part-time jobs. We heard of Sebastian through common friends, and since he’s studying music it wasn’t exactly hard to tell if he’d be a good fit to the group. OTH! : I have to say, you’ve come one hell of a long way in your music career. I’m still in awe that you all collectively picked up and moved out of Normandy in the first place just to pursue the dream that came to be Aerials. Since the move to Birmingham, contingent with the release of Foresight, you’ve returned to Norway. What spurned the return home? Was Norway’s doors calling you back home, or was it also a business move? Markus: Glad to hear you think so! To be honest, there was nothing other than economics that forced us back home. We had already used all our savings when we bought our own van, new gear and then moving away from Norway. We put so much money into the EP and ended up taking huge loans to make it happen. When the EP was fully written we had to head back home, and I actually ended up tracking my own vocals for the EP myself to save money. Being signed to a label definitely makes it less expensive, so we’re working extremely hard to make that happen. OTH! : As I mentioned before, you guys did an awful lot of travelling around just to make Aerial a reality. Hell, you’ve even sonically moved several times, shifting into harder and harder styles of rock and metal music before you settled on metalcore. Not to mention, trekking to Budapest and back, then Birmingham and back again. That takes a serious amount of dedication that I think most other projects simply don’t possess. Thus, it truly comes as no surprise to me that you found yourselves racking up hundreds of thousands of plays on Spotify. Also, landing yourselves on Skjærgårds festival! How does it feel knowing that your hard work- the constant moving around; sans a label or management- has really paid off? Did it surprise you at all? Or did you always sort of figure that you’d be making waves in some format? Markus: As we’ve been talking about before, we’ve played together for many years in different bands earlier, so we knew that if Aerial was going to work we’d have to go all-in. We’ve sacrificed so much for our band, so hopefully it will pay off. We’re really stoked about the attention we’ve received on Spotify and YouTube, so that’s been amazing. Hopefully a management [company] and a label will pick up [on] the effort we’ve put into our music and see how much we work for what we believe in! OTH! : Speaking of a lack of a label, are you currently shopping around for any label support for upcoming release, or do you plan to self-release and promote it? Markus: Absolutely. As I mentioned above, we’ve tried really hard to shop for labels, but being a Norwegian band without any contacts makes everything so much harder. Now that we’ve build a good fanbase all over Europe and America, with hundreds of thousands of plays we’re hoping that it can help us get label where we hopefully can release a full-length album. Markus: Yes! We’re actually doing a European Tour with the band John Wolfhooker in April, so we’re really stoked to be hitting the road again and visit some of the places we visited last year! OTH! : So, projecting into the future here a bit- what’s next for Aerial? What direction do you foresee yourselves taking as the band continues on throughout the years? Markus: We’re full of hopes and dreams, and we’re working hard every day to build a future for our band, so expect huge things from us in the future! OTH! : Thanks for taking the time to speak with me, Markus! Before I let you go, is there anything else you’d like to add? 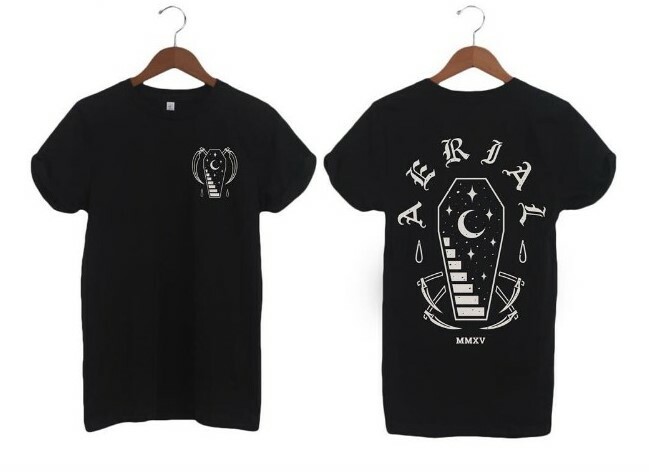 Buy our merch and wear it to support our band! Also, make sure to keep following us on FB and IG to get to know us better. We want people to get to know us more as individuals, so there´s going to be a lot of content based on that coming out this year.